Lake Tanganyika is the longest freshwater lake in the world, and a natural wonder but one of the strangest battles of WWI took place on its placid waters. Lake Tanganyika sits between Tanzania (then German East Africa) and the Democratic Republic of Congo (then Belgian Congo). The Allies wanted to capture German East Africa, but they needed to control the lake to do so. The Germans, however, dominated the lake due to their ship the SMS Graf von Goetzen. British troops were able to push into German territory from the sea and coast, but the great lake severely hampered their inland movements. German control of the lake meant they were able to move troops along it and redeploy behind British lines, thwarting any invasion. First Sea Lord Henry Jackson was in charge of bringing the war to Germany’s colonies, but he needed ships. Germany also had two converted steamers the Hedwig von Wissmann and the Kingani on the lake. Both were small and lightly armed, but they harassed Allied positions on the shore. Jackson needed a way to bring a boat to the lake, launch it, and then fight and win against the Germans. A big game hunter and Boer War veteran John Lee advised Jackson that he knew of a way to get boats to Lake Tanganyika. The SMS Graf von Goetzen had been built in Germany, disassembled, packed into over 5,000 crates, and shipped to Dar es Salaam in Africa. From there, it was transported overland to a shipyard on the lake, where it was reassembled. She was then armed with two 37mm Hotchkiss Revolver Guns from a scuttled commerce raider the Moewe, making her even more dangerous. Lee believed that small motor gunboats, brought to the river through inland routes would be able to defeat the larger ship, especially if given guns with a 7,000-yard range, enabling them to outmaneuver and outgun any of the German craft on the lake. They just needed a man to lead the expedition. They found one; Lieutenant Commander Geoffrey Spicer-Simson. He was known as a braggart, a liar, a hot head, and was the oldest Lieutenant Commander in the British Navy at the time. More importantly, he knew the region, spoke French and German and was both available and willing to lead the expedition. His previous ship had been torpedoed and sunk while he was entertaining guests on shore. 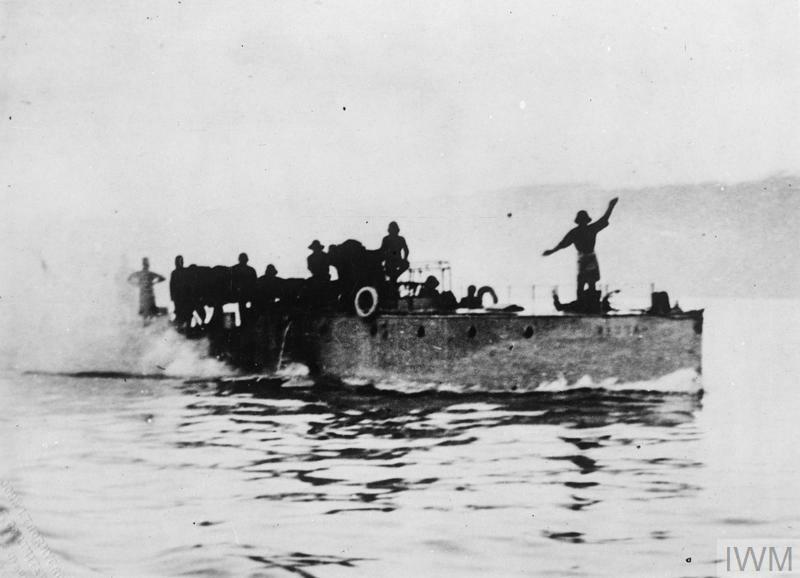 Simson selected two 40 foot armed motor launches named HMS Mimi and HMS Toutou and 27 men. They set out from England on board a transport ship for the voyage to Africa. Meanwhile, Lee set out north through the bush, clearing a path for Simson and his boats. Simson landed at Capetown and loaded the two boats onto a train bound for Fungurume. From there, they used oxen, steam tractors, and brute force, to pull the motor boats overland nearly 150 miles, rolling them on logs. The operation was certainly one of the most eccentric and strangest attempted during the war, but there was no better way available. They made it to another railway, at Sankisia, then to Bukama, a short river journey to Kabolo, and a final rail journey to Lukuga, where the boats were launched into Lake Tanganyika. On December 1, 1915, the Kingani was spotted by the British vessels. They killed the commander and knocked out Kingani’s only gun; all achieved in only 11 minutes. Simson had his first victory, a German ship captured, no loss of life, and without alerting German forces. The Kingani was refitted and named the Fifi. Gustav Zimmer, commander of the German vessels in the lake, did not investigate the Kingani’s disappearance until mid-January. He sent the Hedwig to scout for the missing boat, but it was spotted by the Allied ships, which by then had three motor launches and a wooden whaleboat. They set out to intercept the lone German boat. As the Hedwig approached, they opened fire. After missing several times, they scored a hit, and the Hedwig began to flood. Another direct hit blew up her boiler, and she sank. The British vessels returned to their port with German prisoners, and the 1st German Naval Ensign captured by the Royal Navy during WWI. Due to their successes on the lake, the Allies had advanced by land and established an airbase on the Western shore. In June 1916 they launched and air raid on German positions. Unknown to British forces, the Goetzen’s guns had been removed to support Paul von Lettow Vorbeck’s guerilla campaign in the region. She had become a deterrent, rather than a combatant. On July 26, 1916, the Goetzen was scuttled in 20 meters of water, effectively ending the Battle of Lake Tanganyika. The war might not have been fun, but it was certainly interesting.